The Office of Marketing and Communication receives numerous inquiries and requests from filmmakers, both large and small, on using university locations for production. There is currently no online component for the process, meaning that all requests must be handled over the phone or through email. Filmmakers often want to see a number of specific locations, such as classrooms or quad areas, and the office has found a number of them that the scouts tend to respond well to. Our team will develop online material, such as a site and a mobile companion, to better the office’s communications with filmmakers. The office will be able to direct filmmakers to information, contracts, and 360 video showcases of the locations available to expedite the inquiries. 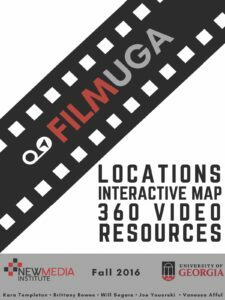 The Office of Marketing and Communication’s Melissa Jackson has been looking to get a web presence for UGA film locations as well as 360 degree video to showcase the locales. She approached the NMI for help with the 360 degree footage, coinciding with the Georgia Film project that Jay Hamilton has proposed. Our project is aimed at UGA, but we have incorporated research on the Georgia film industry to better market the product and better understand why the department has had an influx of inquiries. Our Vision: Our project will result in a clean, accessible way for filmmakers of all statuses to explore UGA’s locations for production. We will effectively market campus as a attractive base to shoot on, as well as offer helpful information and material to facilitate the process. Our vision is to have a product that proves useful to filmmakers, UGA, and the office’s employees themselves through one medium.